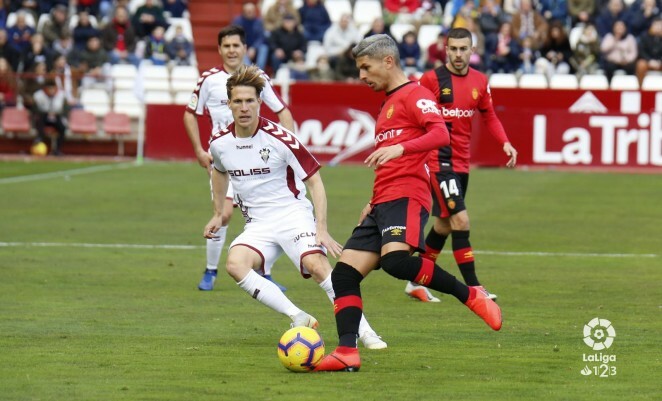 Salva Sevilla: "It is important to extend the streak in Son Moix"
The midfielder from Almeria has analyzed in a press conference the next league commitment (Sunday, 12:00 hours, in Son Moix) against Lugo. Salva expects a complicated opponent: "All the rivals are going to play a lot, the Lugo comes in a complicated situation and it will cost us. It is important to extend the streak of strength we have at home. This week we are working to the maximum and we are looking forward to Sunday to add the three points, which would be very important". As for the difficulty of adding points away from Son Moix, Salva is blunt: "The second round is always much harder and winning away matches costs a lot. All teams play important things. The team is competing and doing things well, I trust to draw points out". The Andalusian footballer transmits a message of tranquility: "We are giving everything we have. If I saw a team from inside that does not want, I would be worried, but that's not the case. The feeling is good. We are doing a good year, a good season. We want to keep adding points". On a personal level, Salva Sevilla ensures that he feels comfortable and important within the team: "I feel good, like at the beginning of the season, things are coming up and the coach gives me a lot of confidence. I work for that, to contribute when I have to play and when I do not play, I will support from the outside. The most important thing is the team, that gets points". Salva Sevilla: "It's to be proud of what we're doing "